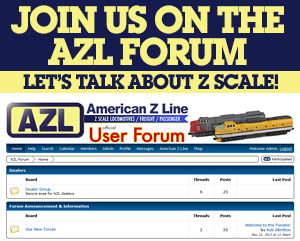 AZL is offering a subscription program for both the NS and UP Heritage SD70ACes. Through this program, you can choose to receive one each of the NS or UP Heritage SD70ACe. The NS series will have 10 different locomotives. The UP series will have 7 different locomotives. This does not include the non-heritage versions for these two roads. By subscribing, you are guaranteed to receive these limited edition versions. If you are interested in subscribing, please reserve with a Visa or MasterCard. We will charge your card for the price of the locomotive and ship once it is available. Shipping will be discounted from our standard rates as part of this program. AZL has announced a very limited run of ATSF Ce-1 cabooses. Three series will be released over the next three months. The first release is the original version with black roofs and all original windows. Three road numbers are available.